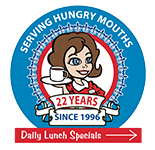 GOBBLE up this great deal from Dot :: Dots Diner :: Big Portions, Big Taste, Big Value! It has been fall for awhile now, but thank goodness it finally feels like it! I’m so glad that the temperature has changed for the better and we can enjoy our sweaters, scarves and even some delicious hot cocoa. I don’t know if you’ve ever had my hot chocolate, but I think it tastes like dessert in a cup! I love this time of year, and with Thanksgiving coming up, I always count my many blessings. One of the things that tops my list year after year is how great my customers are. I am so thankful for your loyalty to Dots, and I know that without alI of you, my diners would only be a dream. As my way of showing my gratitude, I’m giving you this coupon for 50% OFF ONE ITEM from my sandwich shack, burger barn, or chicken coop menu. Just print it out and bring it on in to receive your discount. And remember, it comes with a big ol’ thank you from me. See y’all soon!